eBay doesn’t allow merchants to use Google Checkout to settle eBay transactions. Google invited eBay online sellers attending eBay Live! in Boston this week to a party that they called the Google Checkout Freedom Party. eBay decides to pull all U.S. advertising on Google. Google backs down, cancels the party. Google looks like a complete wimp; eBay looks like a bully. 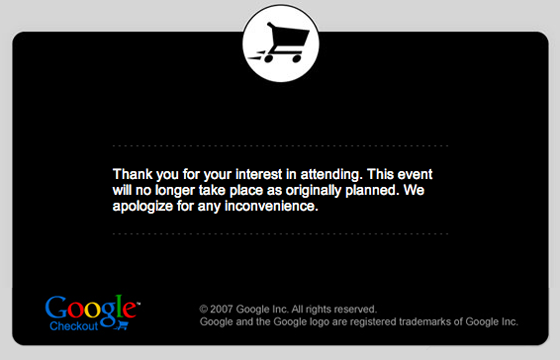 The party appeared to be nothing more than Google poking a little fun at eBay’s restrictive policies. eBay hit back with the biggest weapon they had, suggesting that tension between the companies goes very deep.